For my Science Sunday post this week I'd like to point out that June 23, 2012 marks 100 years since the birth of one of the most important scientists or mathematicians of the last or any other century. Alan Turing is the father of Computer Science, was pivotal to the defeat of the Nazis in WWII and was tragically persecuted and punished for his homosexuality. This year has been declared Alan Turing year in commemoration and Computer Science conferences and around the world will be running special sessions to honour Turing and Computer Science departments everywhere will also be holding events. The museum at Bletchley Park where Turing worked in WWII to break Nazi codes has received special funding from software companies and others to build up the museum and run events. Some of the core ideas that Turing considered were: What does it mean to compute something? Can computation ever be used to mimic or reproduce intelligence, and would be able to tell the difference? If you want to go one step further and learn more about what CS is about and how Turing's ideas changed the world you may still be able to sign up for one of the courses being offered free and online by Stanford University. The Computer Science 101 course is a good way to start understanding how the computers that make our modern world possible function, a world Alan Turing contributed so pivotally to making possible. For a bit more of a challenge the course on cryptography should address the same issues Turing and his team at Bletchley Park worried about trying break Nazi codes. 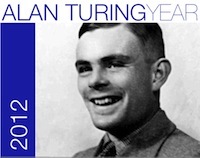 Turing's other popularly known contribution was about the relation between computation and intelligence. This would have been best addressed by the course on AI offerred last term which thousands of people registered for. That course is not offered this term, but some related courses this term are offered on machine learning and graphical models which are at the forefront of modern research into artificial intelligence.